Strange as it may seem I painted this cruise liner on a dog walk along the coast path last weekend. I took the painting kit on the off-chance that something would grab me, I was pondering a fisherman when I saw what was on the horizon. It was moving at a rate of knots, literally, so I painted the ship first and then painted the rest around it. It’s the MV Discovery which offers cruises from Avonmouth to places like the Hebrides, Iceland, Norway and erm … Liverpool. After looking at it when I got home I thought I’d overdone the prow and nearly shortened it. I was relieved that I hadn’t fiddled when I looked at the MV Discovery site for a link for this post I was pleased to see it looking quite long nosed (I’m pretty sure that’s the correct nautical term). 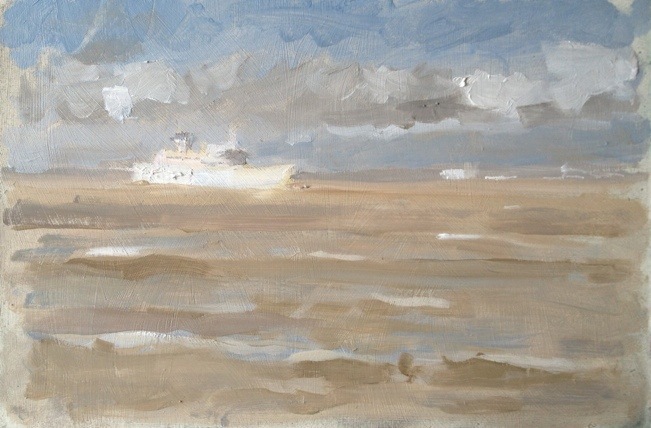 This entry was posted in recent work and tagged MV Discovery, Oil, plein air, Seascape by ianpriceart. Bookmark the permalink.